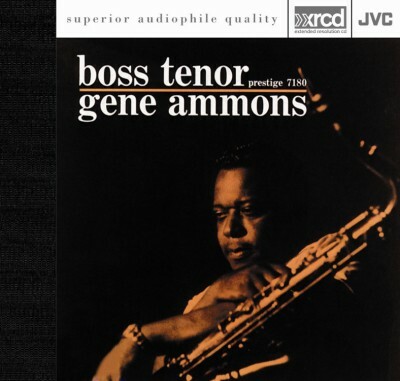 Description: At Prestige, Gene Ammons basically did two types of sessions: a jamming situation with several other all-star horns; or a quartet format featuring a top-flight rhythm section behind him. Whatever the setting, "Jug" as he was nicknamed, displayed that dominant trait held in common with other giants in the grand history of his chosen instrument, the tenor saxophone -- the ability to tell a story. Here are the blues, the ballads, Charlie Parker's "Confirmation," and Eddie Heywood's "Canadian Sunset." The latter had Been a hit for its pianist-composer and was again for Ammons. An added feature here is the addition of jazz-oriented conga player, Ray Barretto, to the piano, bass, and drums of Tommy Flanagan, Doug Watkins, and Arthur Taylor. A classic album, lovingly and carefully remastered by JVC's perfectionists for discerning audiophiles! Produced by Bob Weinstock. Recorded by Rudy Van Gelder in Edgewood Cliffs, NJ, June 16, 1960. This XRCD produced by Akira Taguchi and mastered by Alan Yoshida at A&M Mastering Studios, Hollywood, CA.